They say it’s going to be a day to remember, and they’re probably right. 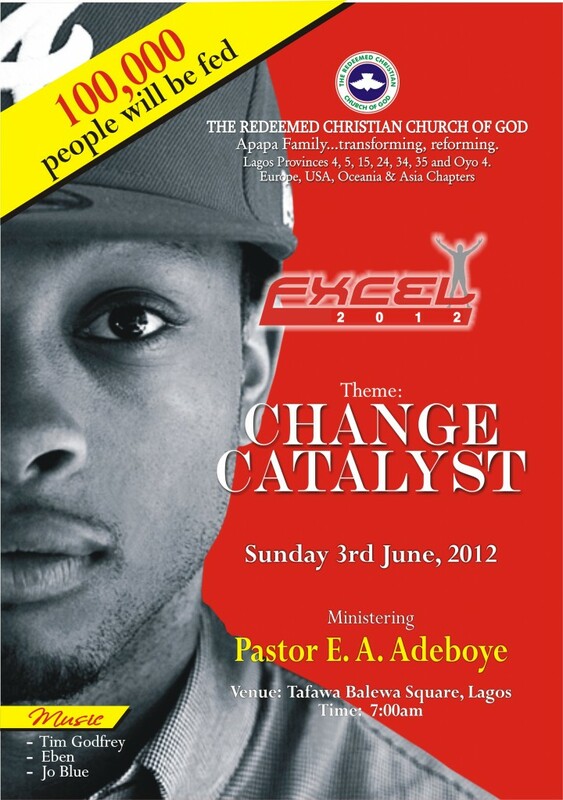 The Redeemed Christian Church of God (Apapa Family) would be holding the 5th edition of her Annual Excel Celebration on Sunday June 03, 2012. The event which is specially targeted to young people is themed CHANGE CATALYST. Ministering at the Epoch Making event would be the General Overseer of the Redeemed Christian Church of God, Pastor Enoch. A. Adeboye. This year’s theme – CHANGE CATALYST is geared towards steering young people into embracing their roles as the core agents of Change catalysts in the society. According to a statement from the organizers, “Excel 2012 is a free entry event with free food and refreshments provided for the 100,000 people expected to attend.” Pastor E.A Adeboye will be endowing a professorial Chair in Mathematics at the University of Ife. This would be in addition to the existing ones he had already endowed at the University of Lagos, University of Ibadan and University of Nigeria Nsukka. The Excel Academy, a mentoring institution for youth leaders would also be officially launched on that day. The young people are in for a fantastic time as Tim Godfrey, Eben and Joe Blue of the Nigerian Idol Fame would also be on hand to minister in music at the event. I always look forward to Excel program each year. Its going to be a program to be remembered for ages.